Bangkok is a place filled with endless things to see and do, and I relish any opportunity to go back there and experience something new. I remember the first time I went, I had the most amazing time and saw the most some truly awesome things. 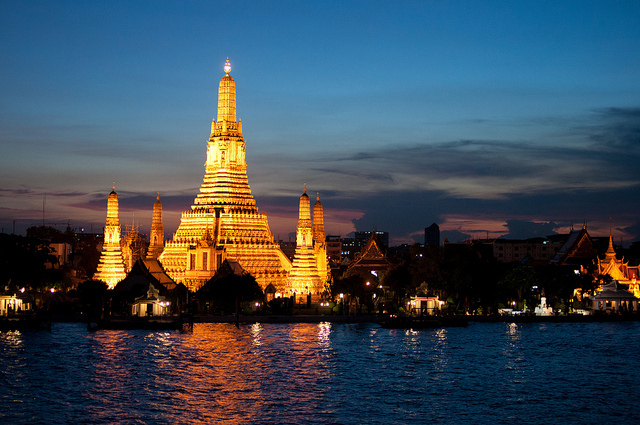 Here are the places that you must visit in Bangkok. Enjoy it and take advantage of every opportunity that you get in Bangkok, you are absolutely going to love it. This beautiful temple with its huge and elegant Khmer spires is an icon of Bangkok, and perhaps the most famous of its temples. The name of the temple comes from Aruna, the God of Dawn, and is definitely a beautiful place to see dawn and dusk alike. The spires are covered in colourful ceramic and porcelain, and the temple is brilliantly lit up at night because of these. One of the best parts of this temple is its very close proximity to Wat Pho and the Grand Palace, so you can visit them all on the same day if you choose to! This also makes it a great place to find an IHG hotel in Bangkok too, so get yourself somewhere nice to stay here if you can. Anyone visiting Bangkok should see Wat Pho, and this temple is particularly famous for the huge reclining Buddha that is about 15 metres tall and over 45 metres long! The statue shines brilliantly due to its gold leaf exterior. The temple is an incredible place to relax too, and a great place to get a traditional Thai massage. This has to be one of my favourite temples in the city! This is definitely one of the must-visit places in Bangkok and was home to the beloved king of Thailand, as well as other government buildings. The architecture is beautiful with its golden spires, and royal white and blue facade. The palace is absolutely huge with a couple of hundred thousand metres to explore (well you can’t explore all of it, but you get the idea). The Thais absolutely love kickboxing and Muay Thai is Thailand’s national sport. People become like football fans in Europe or gridiron fans in the States. These two stadiums are the places where the biggest and most important fights occur. Watching a Muay Thai fight is absolutely exhilarating due to its intensity and electric atmosphere that is generated by the crowd. It really is something that you don’t want to miss when in Bangkok. The Thai people absolutely love to eat out, and it is unlike anywhere else I have been in Asia in this sense. Because of this, there are many street food stalls where the locals eat. This also makes it very easy to tell if the food is good or not because the popularity with the locals does not lie. You should be eating street food as much as possible because it just tastes so good. I love to eat a beautiful papaya salad (Som Tam), pad Thai, and all the seafood I can get my hands on. The best thing is that it is extremely cheap and extremely tasty, so don’t forget to treat yourself.